Do you feel like your feet always move too much inside your shoes? Do you also feel like both your heels slip off your shoes every time you walk or run? Most women will agree that shoe shopping is supposed to be fun, but for women with narrow feet it takes more than choosing a shoe style they like, tried them on, and have the salesperson ring them up. Women with narrow feet have the hardest time finding shoes that FIT. I have been working for a specialized family shoe store for 8 years now and I am expert in fitting children’s, men’s, and women’s shoes. 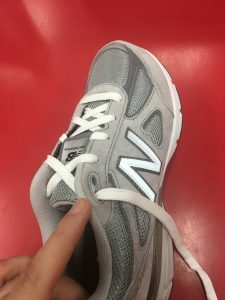 I have heard several people complain about how hard it is to find shoes that come in wide or extra wide widths, but it is actually much harder to find shoes that come in narrow widths. While shoe companies make several shoes that come in wide and extra wide widths, there is a very small selection of shoes that actually come in narrow widths. Don’t panic! I have fitted hundreds of women with narrow feet and I know exactly which shoe styles run narrower than others. 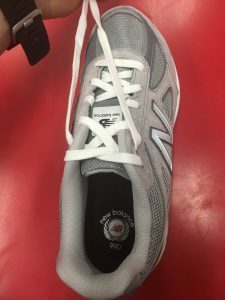 The two main issues that people with narrow feet have is how their feet move too much inside the shoe, and how the heel keeps slipping out of the shoe. This will lead to foot issues such as blisters, calluses, and corns, just to name a few. A shoe that is too wide can also lead to foot and leg pain, since you won’t get any of the benefits that the shoe has to offer. 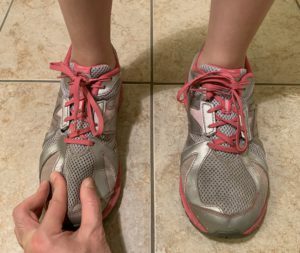 There are certain shoes that definitely will fit narrower than others, but it’s important to at least try shoes that come in narrower widths to see what a difference they make. It’s also important to find shoes that will have a pointier toed box instead of a rounder toed box, and the heel counter of the shoe must be as narrow as possible. Let’s me emphasize that shoes in narrower widths do EXIST, and you will notice an immediate difference when you try them on! I am 100% sure that I will be able to find you a pair of shoes that will FIT your narrow feet. However, in certain cases we must use other methods to help the shoes FIT better. For example, there is a way of tying the shoes that will hug your feet better, preventing it from moving too much inside the shoe and making you feel more secure and stable. Also, do you know what a tongue pad is? I have used hundreds of tongue pads through the years and I normally use them when the person has narrow feet. Tongue pads are adhesive backed pads that fit in the tongue of the shoe, they will push your foot back, securing it against the heel of the shoe and preventing heel slippage. They will also make the shoe feel a lot snugger. Those methods will be explained in more detailed thorough the post, but they are used a last resort when someone has extremely narrow feet. Luckily, there are more shoe brands for women with narrow feet than there used to be, and many of them have fashionable choices! I am confident that the shoes I will describe in this post WILL FIT your NARROW feet. So please STOP wearing shoes that DON’T FIT, and prevent foot and leg problems in the future. How Can You Tell If You Have Narrow Feet? – Follow These Steps! Did you know that according to the National Shoe Retailers Association nearly 33 percent of all women have narrow feet? The problem is that most of these women are not aware that they have narrow feet, and when they try a shoe and feels too wide, they try a smaller shoe size for the shoe to feel snugger.. The issue with getting a shoe that is too short is that it will end up creating all sort of issues to your feet. So, how can you tell that you have narrow feet? The first sign you must pay attention to is to check if your feet move too much inside the shoe. For example, if you can slide your finger around the heel area of the shoe that means the shoe is too wide. Also, if you feel like there is a lot of extra space around the toed-box of the shoe, it also means that it’s too wide for your feet. There are different types of narrow feet. Did you know that you might have narrow feet but still require a deeper or wider shoe for your feet? I know this sounds really confusing, but I have fitted children, women, and men with narrow feet and a high instep in deeper, wider shoes. Do you know what the instep of the foot is? If you don’t, then you can’t possibly have been getting the correct shoe size. The instep of the foot is the top part of the foot, and if it’s high, then it takes a lot of space inside the shoe. A narrow foot with a high instep is the most complicated one to FIT, since we must accommodate the narrow foot but the high instep as well. 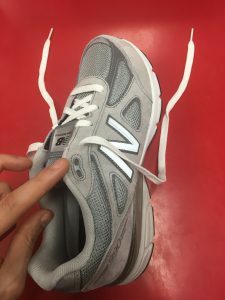 Why Are Narrow Shoes So Hard To Find? I believe that the main reason is that there is not enough demand for shoe companies to actually make shoes for women in narrow widths. But the lack of demand is due to most women not being aware that their feet are narrow. The biggest mistake women make is to buy shorter shoes in order for the shoes to feel snugger and hug their feet better. This will end up creating all sort of foot issues such as blisters, calluses, ad corns. Our toes need space between the end of our toes and the end of the shoe because when we are walking or running, our foot tends to slide back and forward, and if there is no space for our toes to move they will start rubbing against each other or against the end or the side of the shoe. If you are not able to find narrow shoes, NEVER fall for the trap of the salesperson who would advise you to buy a half-size smaller in order to make up for the fact that you need a narrower shoe. The shoe will definitely feel better (snugger) at the beginning, but your toes will be cramped in the shoe which will lead to calluses, blisters, and corns. 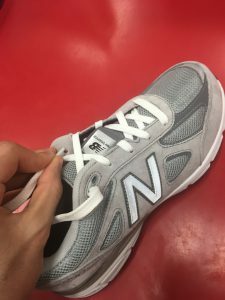 While shoe companies make just a few shoes in narrow widths, there are several shoe styles that I have fitted before that tend to fit narrower than others. I will share this secret below! The Best Narrow Running Shoes For Women – The Secret Revealed! Let me tell you that by far the best running shoes for women with narrow feet are made by Asics. Not only Asics provide some of the most supportive shoes (they make some of the best running shoes for women, men, and children), but most of the styles will FIT narrow feet perfectly. The shoes come with a very narrow firm heel counter, and they have a pointy toed box. Arch support to minimize the impact that your feet receive every time they come in contact with the ground. A firm heel counter to provide excellent ankle support. Mesh upper to allow your feet to breathe. An outsole with great traction on a variety of surfaces to prevent you from slipping. Flexible, lightweight materials to prevent your feet and legs from getting tired easily. Removable insole (so you can easily replace it with a more supportive insole or orthotic). These are the features that the shoes I will describe below will provide to your feet, but please remember that the shoes must FIT the shape of your feet properly, otherwise you won’t get any of the benefits the shoe has to offer! How To Measure Foot Size – The Most Simple And Effective Way! Now that you know how to make sure your shoes fit, below you can find a selection of the best running shoes for women with narrow feet! These are all shoe styles that I have fitted before made by Asics, and they are not only some of the most narrow shoes I have ever fitted before, but they also provide the best support and stability! All of these shoe styles fit “short”, which means that you need to go a whole size longer of the size that your feet measure in the shoe measuring scale in order to not cramp your toes against the end of the shoe. My coworker who has been working at the shoe store for over 30 years taught me the best method to tie shoes for people who have narrow feet (this method is also used for people who wear orthotics). I actually use this method to tie my own shoes, even though I don’t have narrow feet. I like how this shoe tying method makes the shoe hug my feet better and secures my heels. 1-Start with leaving the top two eyelets of the shoe open. 2-Go through the top hole first. You are all done! You will notice a difference right away. This shoe tying method is extremely effective and it also works great for women who wear orthotics. I showed you the best narrow running shoes for women, but what about casual shoes? Most women don’t like to wear their sneakers all day, and need shoes for when they go to work, the shopping center, or when they go for a walk to the park. There are several pairs of mary janes and flats that I have fitted before that will FIT women with narrow feet perfectly. I always recommend mary jane shoes over flats, since they come with a velcro strap across the shoe which will hug your feet and provide more support and stability to your feet. The advantage of mary jane shoes is that they will provide more support and structure to your feet. Some of them even come with a built in arch support and a firm heel counter so you can wear them for longer periods of time. You will notice how they even come with a rubber outsole that will provide traction to your feet. We must first identify which shoe brands and which shoe styles will fit your narrow feet. I have fitted a particular shoe brand called Clarks which is one of the BEST, if not the BEST shoe fitting brand for women with NARROW feet since their shoes are actually available in narrow widths. The shoes are supportive, lightweight, made of high quality materials and stylish at the same time. Below you can find a selection of the best casual shoes for women with narrow feet! Do you always have a hard time finding narrow shoes for your feet? Is there a particular shoe style you have found that works well for narrow feet? Please share your thoughts and experiences below so we can all benefit from them! Extra Wide Sandals For Women – They Do EXIST! 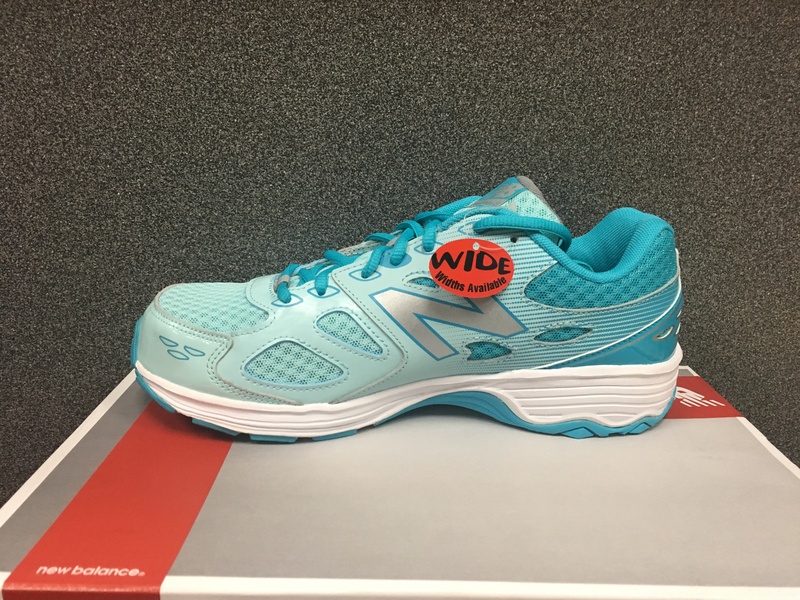 Wide Running Shoes For Women – The Best Running Shoes For Women With Wide Or Extra Wide Feet!